• Date Built: Projects Built From 1830s to 1950s. The City of Marseilles was founded by Ephriam Sprague in 1832 when he moved to the area to establish a sawmill. 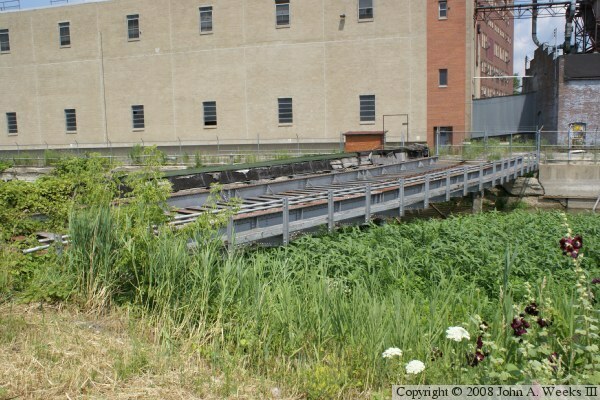 He was aware the the Illinois and Michigan Canal would pass though the city, and he wanted to be in on the ground floor. He named the city Marseilles because he thought it was an ideal place for an industrial center, much like the industrial city of Marseilles, France. Sprague forgot, however, to secure his land claim. 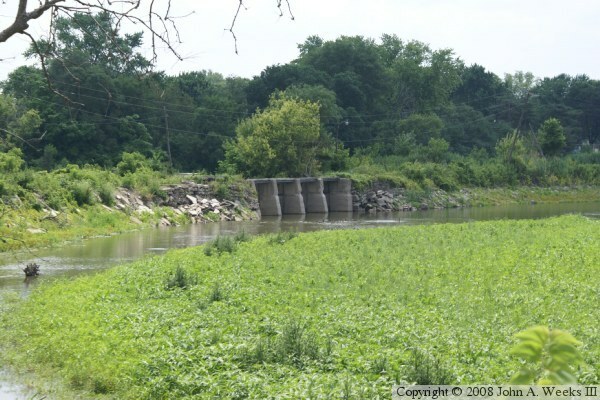 The next year, Lovell Kimball moved into Marseilles, and built a new dam just down river from Sprague, flooding out Spragues dam and mill, and ruining his business. Kimball prospered for a decade, until his grist mill burned in 1842. His insurance failed to pay off, leaving Kimball both broke and broken. He died shortly after that. 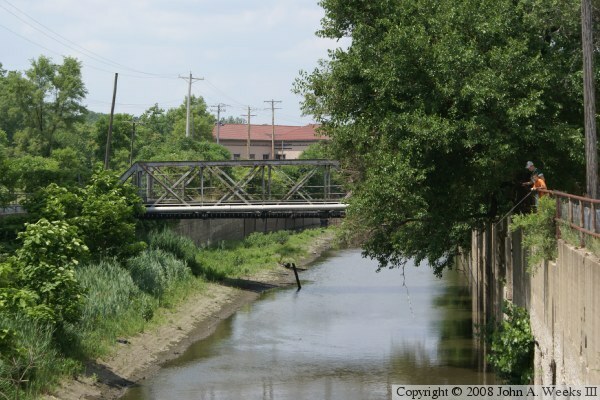 The depression of 1837 caused work to stop on the I&M Canal when the State of Illinois went bankrupt. Work on the canal resumed in Marseilles from 1841 to 1844, with the canal opening in 1848. 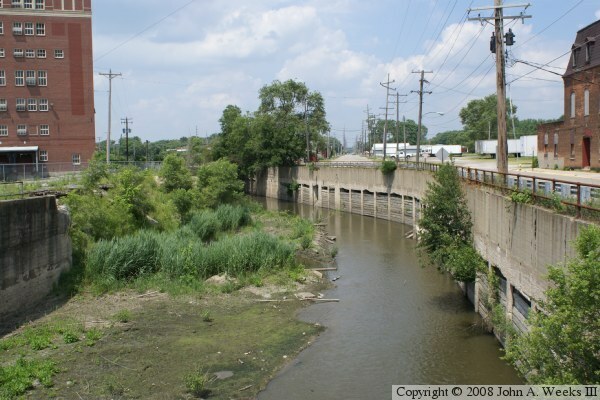 The canal was the superhighway of the 1800s, at least before the advent of the railroad. Marseilles prospered, and a number of industries built in the area. The railroads arrived in the 1850s and became the preferred mode of transportation after the Civil War. Many communities along the canal were bypassed or otherwise failed to thrive after the railroads supplanted the canal. Marseilles not only survived the railroad, it thrived in the age of the steam horse. In time, a major coal mine was located a mile south of Marseilles. A paper mill was built in the central milling district. National Biscuit (now Nabisco) built a box and package warehouse in 1921, and later built a folding carton assembly line. 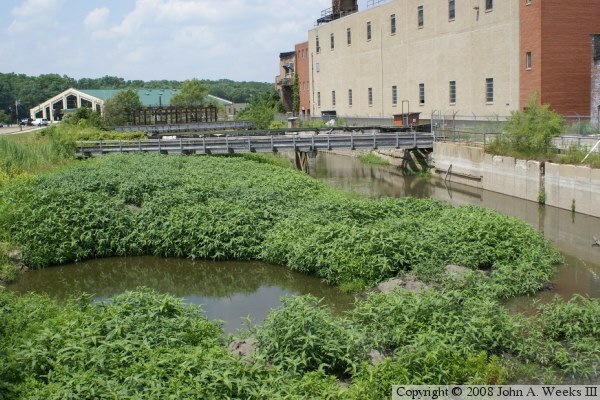 To power these plants, a small canal called a mill raceway was dug in a semicircle from the river, through the mill district, and back out to the river. The 15 foot drop in water over the nearby rapids provided the difference in water level to generate mechanical power. 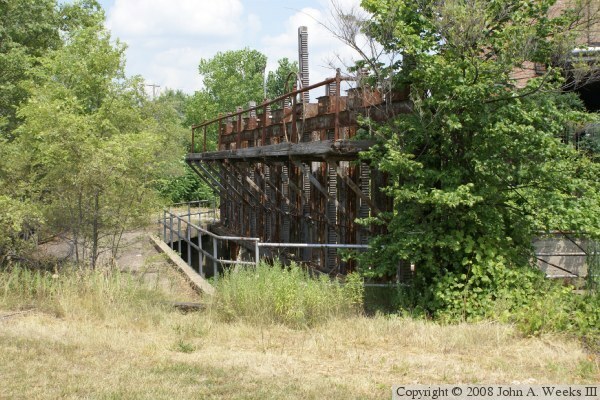 The first mill raceway was built in the 1880s. As the towns along the I&M canal adapted to life in the age of the railroad, each town installed electrical trolley systems. Due to the use of direct current power, the trolley cars could only venture a mile or two from a power generating plant. The advent of alternating current changed everything. Power could now be transported for miles over copper cables. The result was that these small trolley systems were joined into one large passenger rail line called the Illinois Traction System. 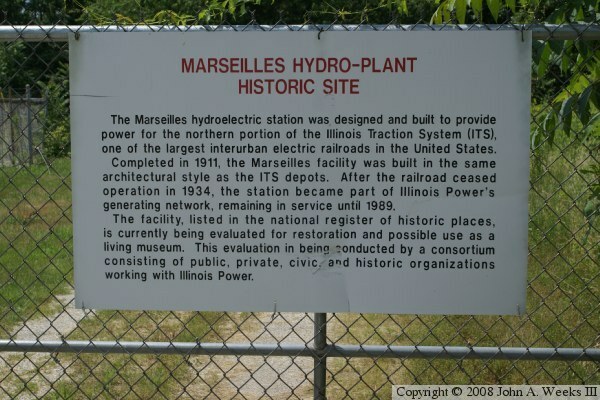 A central power plant was built in Marseilles in 1911 to power the rail cars. This project included digging a second mill raceway in a bigger circle around the existing mill raceway. The outlet of this raceway would feed into a newly built power plant located right on the edge of the Illinois River. The Illinois Traction System failed during the Great Depression, and stopped running rail cars in 1934. 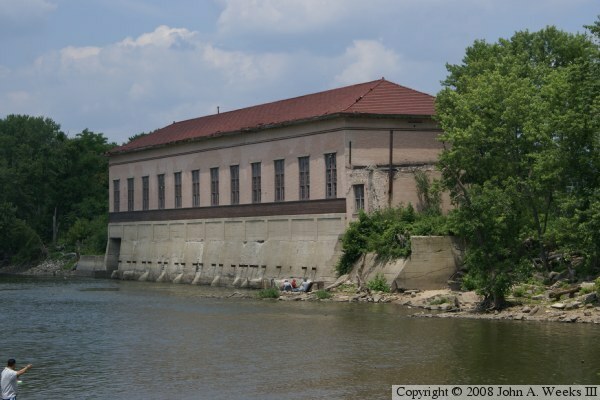 At that time, the power plant was merged into the Illinois Power & Light system. It was operated by IP&L until the plant became obsolete in 1989. Since 1989, there have been attempts to restart the power plant and to turn it into a living history museum. These projects never got off the ground. But in 2006, North American Hydro stepped in an purchased the rights to operate the hydro plant. They agreed to put in more efficient modern turbines. They will sell the power to the commercial power grid for the fee of 1% paid to the city of Marseilles. That fee is estimated to be $30,000 to $35,000 per year. The plant is expected to be finished by 2009, and be online in 2010. The project would require the north mill raceway to be repaired and once again filled with water. It will be good to see water power back in action in Marseilles again. The diversion channels that carry water to the mills and back to the river are called raceways. The mill district in Marseilles has to semicircular raceways, the older south raceway, and the newer north raceway. The north raceway completely wraps around the south raceway. In these two photos (above and below), we see two different combination rail and truck bridges spanning the south raceway and entering the Nabisco warehouse. Note that the raceway is mostly overgrown with weeds. The photo above is the gate structure at the head of the south raceway. Notice that one gate is open, and the rest are closed. The open gate can be identified by the metal bar with teeth that is sticking up in the air. The metal wheel is used to raise and lower the gates. Also notice the concrete bridge to the right of the gates. The photo below is an overview of the remaining buildings in the milling complex. The older and taller building is the National Biscuit Company folded carton warehouse. The newer building is a Nabisco warehouse. 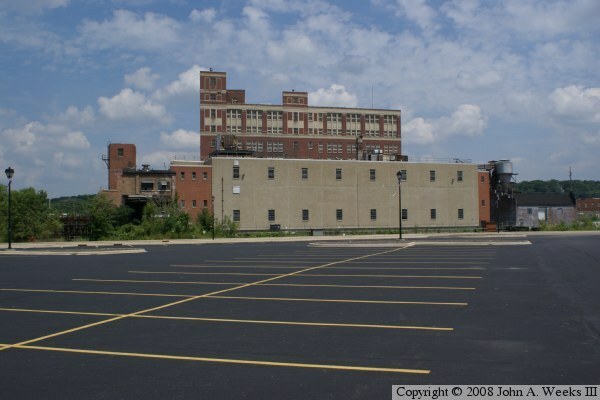 The land to the right of these buildings was the site of the Marseilles paper mill. It has since been cleared and a wireless phone store has taken its place. The IP&L power plant is behind the newer Nabisco building. Above is a view of the south raceway looking downstream. One wall of the raceway has collapsed, and the raceway is largely filled with debris and muck. 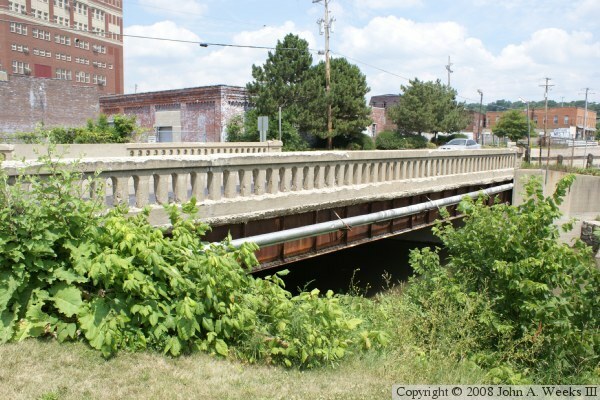 Below is the Main Street bridge over the south mill raceway. These photos (above and below) are two more views of the Main Street bridge over the south mill raceway. 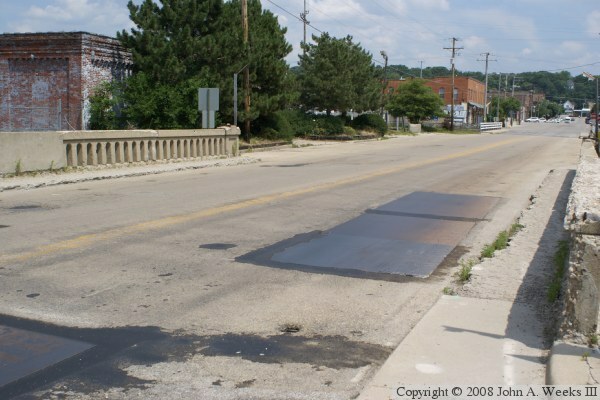 Notice that steel plates have been placed over large potholes in the road. The photo above is looking upstream from the Main Street bridge over the south raceway. The row of debris separates the north and south raceway. The concrete structure is an overflow gate to allow water to flow back to the river in the event of a flood. 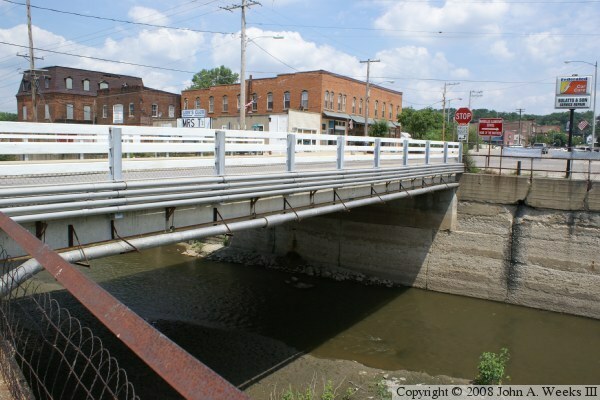 The photo below is the Main Street bridge over the north mill raceway. This is a more modern bridge, and the raceway is in much better condition. It is still, however, mostly dry. Some historic buildings in downtown Marseilles can be seen in the background. 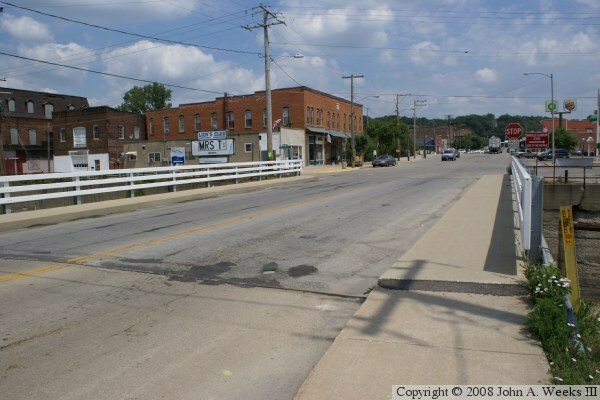 The photo above is another view of the Main Street bridge over the north mill raceway. The photo below is the bridge plate from the structure. While the bridge dates from 1911, the bridge plate was attached after a rebuild project in 1982. The photo above is looking upstream from the Main Street bridge over the north mill raceway. Again, the channel is clogged with debris and weeds and is largely dry. 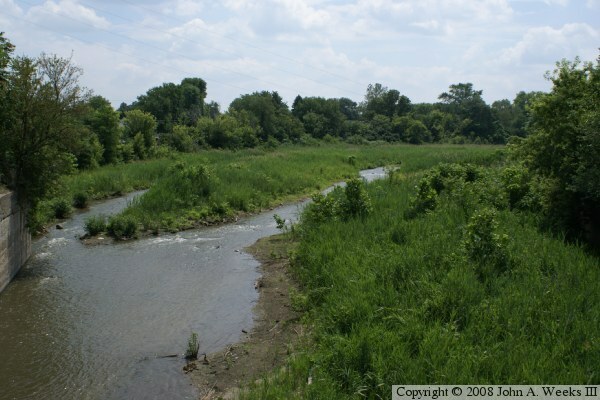 The photo below is taken from the same location, but this time, looking downstream. 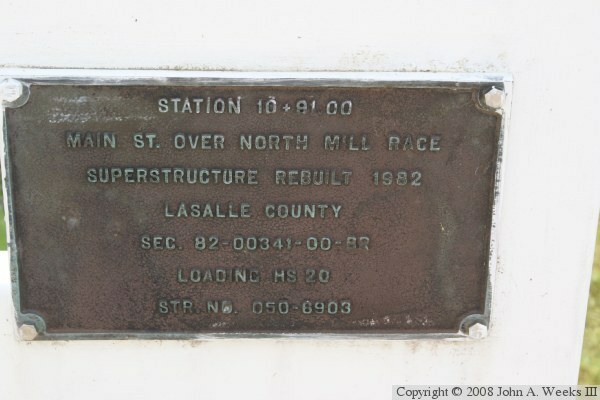 The north mill race was used exclusively by the IP&L power plant. 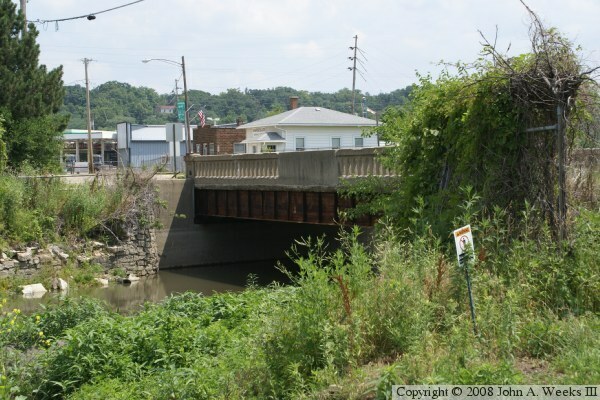 Looking downstream, we find a pony truss style bridge over the north mill raceway behind the National Biscuit Company plant. The power plant can be seen in the background with its distinctive red roof. The photo below is the sign on the gate blocking the path to the power plant. 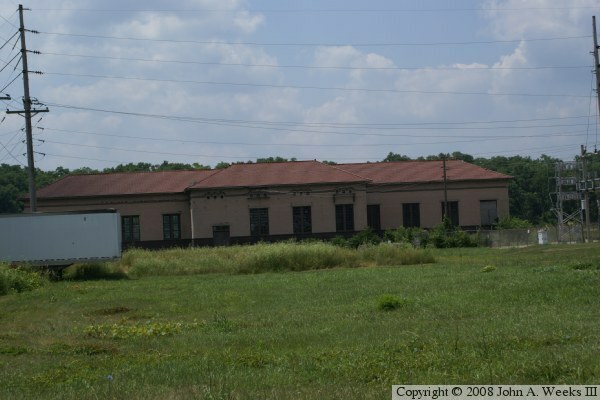 While the power plant has been idle since 1989, it is slated to be rebuilt starting in 2009 and be in operation by 2010. Here are two views of the IP&L power plant. The view above is from a city street, while the view below is from the river. 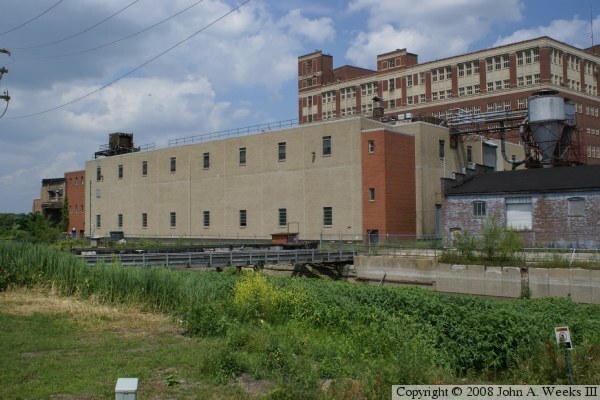 Water from the north mill race would accumulate in a pool on the street side of the power plant, then enter the basement of the building where it would spin large turbines. 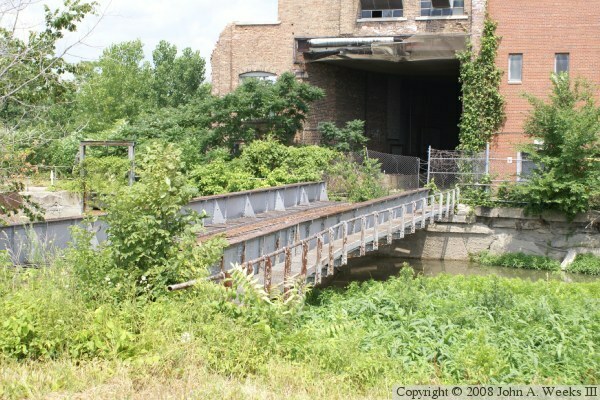 The water would then exit out the back of the power plant into the Illinois River.